It’s possible Snowdon is one of the most popular hills in Britain simply because it’s the highest in all of England and Wales, but I like to think it’s because it’s also one of the best: a giant massif of individual summits joined by ridges broad and narrow, and separated by towering cliff faces and secluded cwms speckled with colourful lakes. Its intricate nature means there are many ascent routes, each with their own character. I’ve hiked up most of them: the Pyg Track, Miners Track, Crib Goch Route, Rhyd-Ddu Path, Watkin Path, Snowdon Ranger Path, Llanberis Path, and even descended by two of its outlying peaks, Yr Aran and Moel Eilio. 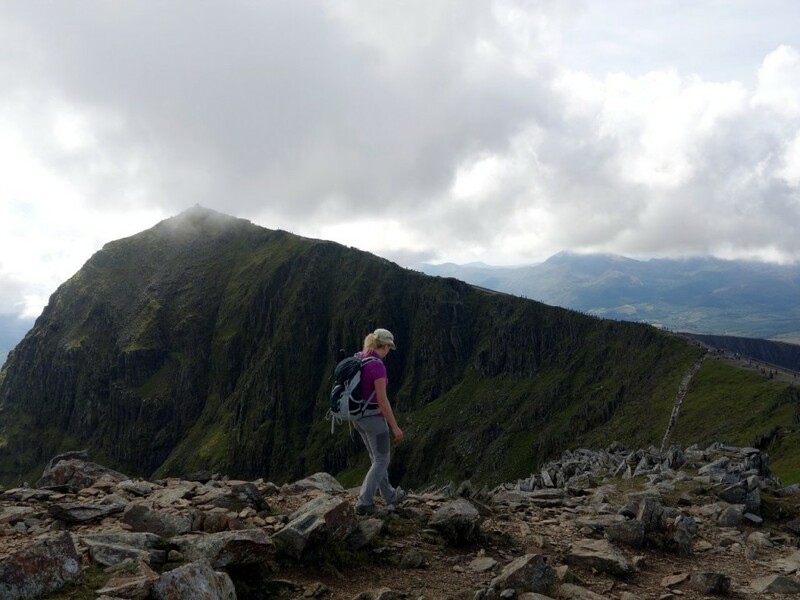 But until last month, I had never done a complete circuit of Snowdon by what is generally regarded as its classic route, the Snowdon Horseshoe. It was long overdue. 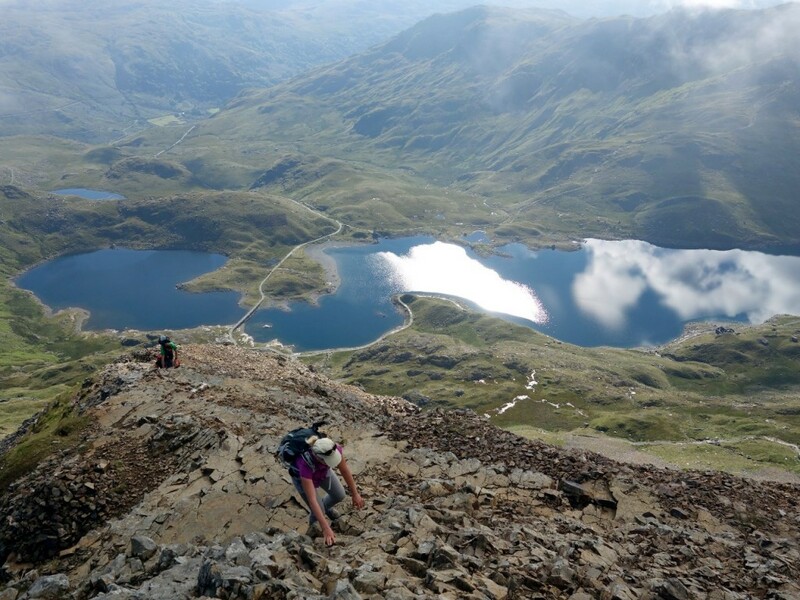 The Snowdon Horseshoe takes in sections of several other routes – the Pyg Track, Crib Goch Route, Watkin Path, Y Lliwedd Route, and Miners Track – as it circles the giant bowl of Cwm Dyli and its two lakes, Llyn Llydaw and Glaslyn. 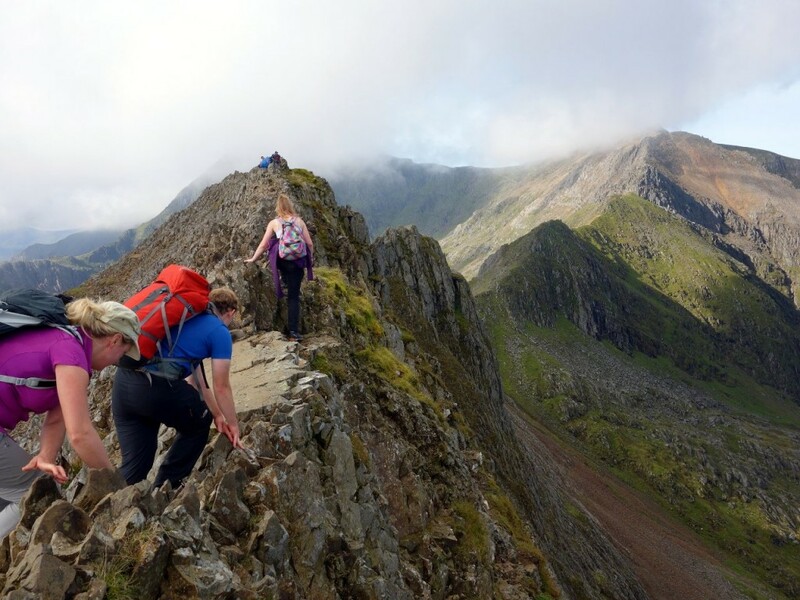 It crosses three Welsh 3000ers – Crib Goch (923m), Garnedd Ugain (1065m) and Snowdon itself (1085m) – and contains three classic ridge scrambles – Crib Goch, Crib y Ddysgl, and Y Lliwedd – each of varying degrees of difficulty and exposure. We were staying at the Pen y Gwryd Hotel at the foot of Pen-y-Pass, the Snowdon Horseshoe’s usual starting point, and wasted ten minutes driving up to Pen-y-Pass car park, only to drive back down again after finding it full. What I didn’t know is that so many people park on the verge near the Pen-y-Gwryd nowadays that they’ve built a footpath up to Pen-y-Pass, which enables you to walk up to the car park and avoid the somewhat dangerous road, with cars speeding around its hairpin. The path was firm and pleasant, and we were up at Pen-y-Pass only twenty minutes after leaving the hotel. It was a glorious sunny morning, the best Snowdonia can offer, and I had already worked up a sweat by the time we started up the Pyg Track, with the rocky triangle of Crib Goch rising up ahead of us. It looks like something of a rock face from the trail, and Edita didn’t believe me that we were intending to go straight up it, but I assured her there was a reasonable trail that only required a moderate amount of scrambling. The trail was busy, and I led the way more quickly than usual as we sped past people. More surprisingly for that time in the morning, there were also people coming down. 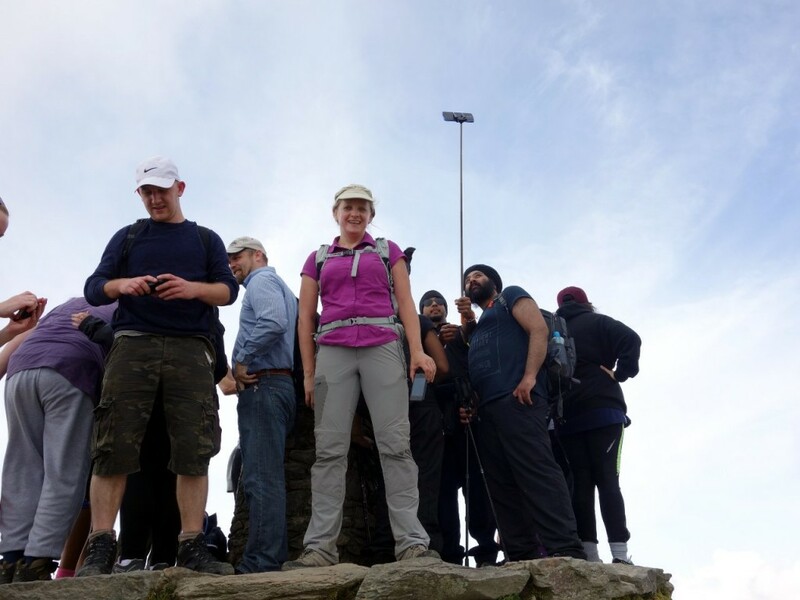 Most of them looked exhausted, and I assumed they had just completed the Three Peaks, which involves climbing the highest peaks in each of Scotland, England and Wales in 24 hours: Ben Nevis, Scafell Pike and Snowdon, respectively. We were in for a bigger surprise a short while later. We crested the rise at Bwlch y Moch and looked down into Cwm Dyli, with the lake of Llyn Llydaw crossed by an old miners’ causeway, and the final peak of the horseshoe, Y Lliwedd, rising up dramatically on the other side, buttressed by sheer cliffs. 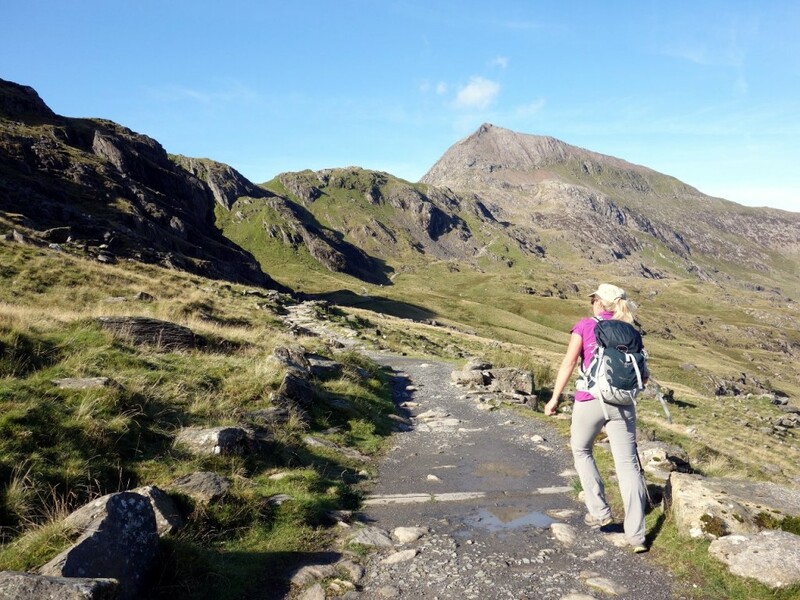 It was at this point we left the Pyg Track on a side path which led steeply up the flanks of Crib Goch. Just before we reached the rocks and began scrambling upwards, we came across a man with a dog. 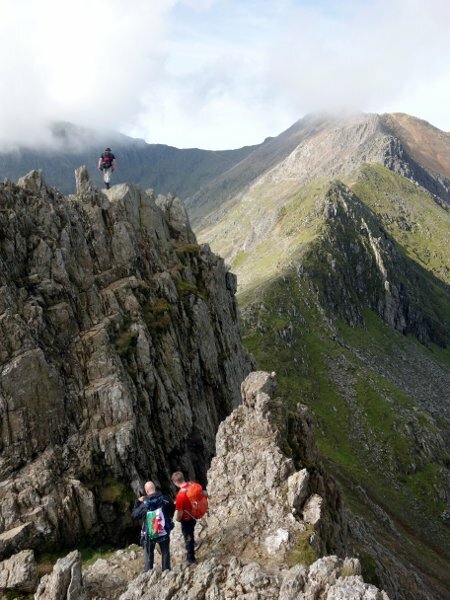 “He’s not really going to take his dog along the knife-edge crest of Crib Goch, surely,” I said to Edita as we passed him. We didn’t find out the answer for this particular canine, but although I never actually saw a dog scrambling along the crest, we passed several dog owners during the course of the day, who all assured us their dogs would be able to get across. I would like to have seen it. 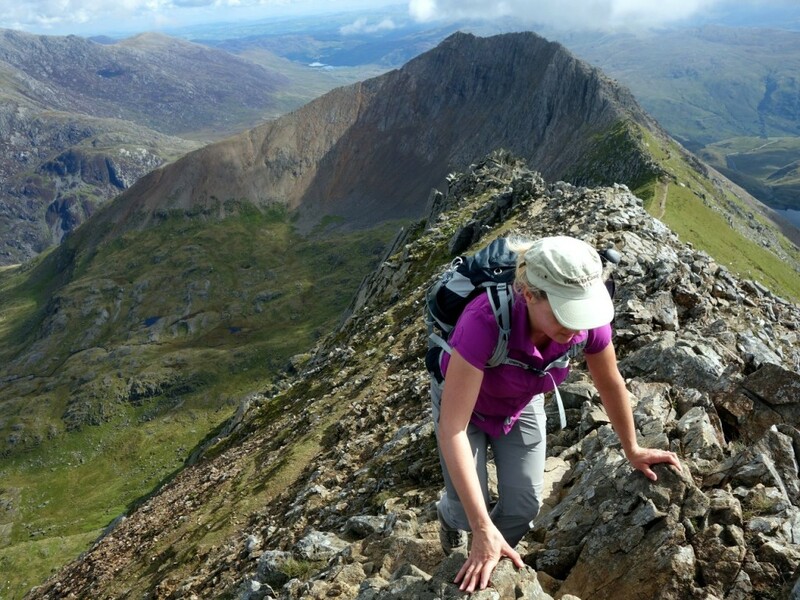 The scramble up to Crib Goch (which translates as Red Comb) is good fun if you’re a confident enough scrambler, with plenty of handholds and a variety of options. It was busy today, and necessary to wait in line in a couple of places. At one point I tried to overtake a big group by taking a shortcut up steeper rocks. It turned out to be the wrong decision. My choice of route was a little trickier than I first thought, and Edita was following so closely behind that I ended up standing on her hand. By the time we rejoined the main trail I could see the big group were now even further ahead after taking a much easier route. 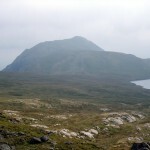 Towards the top of the ascent, the gradient lessens and the trail narrows into a ridge. At this point it’s possible to walk up on steep slabs that rise up like steps. There were airy drops on both sides, but this section was merely an introduction to the sudden exposure that was about to greet us when we reached the crest of the ridge. On the two previous occasions I’ve traversed the Crib Goch ridge, I did so in thick mist, and I had no sense of the drops on either side. On this occasion we experienced the full effect. There are many words to describe it – some less polite than others – but the one I’m going to use is exhilarating. It truly is a knife edge, at times less than a metre wide. Although the scrambling is straightforward, there is no margin for error, and the most likely outcome of a slip is certain death. “Are you supposed to stand up?” Edita asked me as she began the traverse. I used a variety of methods myself. There was very little wind today, which can easily turn straightforward into slightly scary. There were times when I felt confident enough to stand on the very crest and stride along with my head held high and a precipice on each side. At other times I kept just to the left, a few feet down from the crest, using the crest itself as a handrail, while on the more turd-jangling sections I could think of no better method than to shuffle sideways crab-like on my haunches. Towards the end of the Crib Goch section of the ridge there are a couple of jagged pinnacles which you can choose to skirt to the left of or climb straight over using a couple of easy rock-climbing moves. We chose the second option, which seemed both safer and easier. At the end of the Crib Goch section there is a grassy platform called Bwlch Coch (don’t ask for a translation) where the ridge broadens out into a space the size of a tennis court. I understand there are escape routes off the ridge on either side here, but they should not be used unless it’s an emergency, as it’s much safer to stay on the ridge, however poor your head for heights. This fact was to have a sequel later in the day. For now I knew there was more scrambling to come along the second rocky section of ridge, Crib y Ddysgl (if you want to know how to pronounce this it’s a popular two-word phrase ending in “off”), but the most exposed, scariest section was done. There are a handful of deaths every year on Snowdon, and the accident blackspot seems to be Crib y Ddysgl. This is because, rather like the escape routes off Bwlch Coch, inexperienced hikers believe it to be safer skirting below the ridge on its left-hand side. In fact, unless there’s a clear path it’s nearly always safer keeping to the ridgeline. I’ve never tried scrambling below the ridge on Crib y Ddysgl, but I’ve made that mistake on other ridges and got into all sorts of difficulties. They tell me trying this on Crib y Ddysgl is very dangerous. 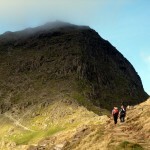 We kept to the ridge and had an enjoyable scramble with fantastic views behind us of figures on the crest of Crib Goch. For a moment we seemed to have left the bottleneck behind, and we strolled nonchalantly onto the broad stony summit of Garnedd Ugain, the second of the Welsh 3000ers. Here we had our first views of Snowdon’s gentler western side. We could see the railway line angling gently down to Llanberis and the rounded top of Moel Eilio rising across a series of grassy cols. It had been busy on Crib Goch, but it was about to get a whole lot busier as we descended to the pass at Bwlch Glas, Snowdon’s equivalent of Clapham Junction. 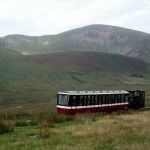 This broad plateau a few metres beneath Snowdon’s summit marks the junction of five footpaths and one railway line. The Pyg, Miners, Snowdon Ranger and Llanberis Paths all converge here, as well as our own Crib Goch Path, and it was absolutely heaving with people who had stopped for a rest before the final wee push up to the summit. Edita had been enjoying her introduction to Snowdonia. We’d had a peaceful scramble up Moel Siabod the previous afternoon, for a long-distance view into the Snowdon Horseshoe, and had soaked in the Everest history at the Pen-y-Gwyrd. By the grittedness of our teeth I could tell she had enjoyed the Crib Goch knife edge a lot more than I had. It was at this point that she started to lose some of her enthusiasm, however. We’d had entire mountains to ourselves during our hikes in the Apennines, and although its highest peak, Corno Grande, had been extremely busy, the summit of Snowdon was about to make the crowds there resemble tumbleweed drifting across the sands of the Kalahari Desert. We joined Genghis Khan and his Mongol Hordes as they seethed up the trail alongside the railway line to the summit. “There’s no point trying to overtake. We might as well plod along behind them,” said Edita, a few moments before running over grassy banks to the left of the trail, a 400m drop into the waters of Glaslyn just a few metres to her left. I struggled along behind her. “You can’t resist, can you,” I gasped. The circular summit platform was jam packed with bodies armed with selfie sticks. I made a beeline towards it. We squeezed onto the platform and took a selfie of our own. Edita even pretended to smile. “Shall we have a pint now?” I said. We walked down the steps and entered Hafod Eryri. Snowdon’s summit cafe and visitor centre. It was like the Glastonbury Festival inside, but without Coldplay. The queue for the bar was nearly as long as the Crib Goch ridge. We turned around and came straight out again. 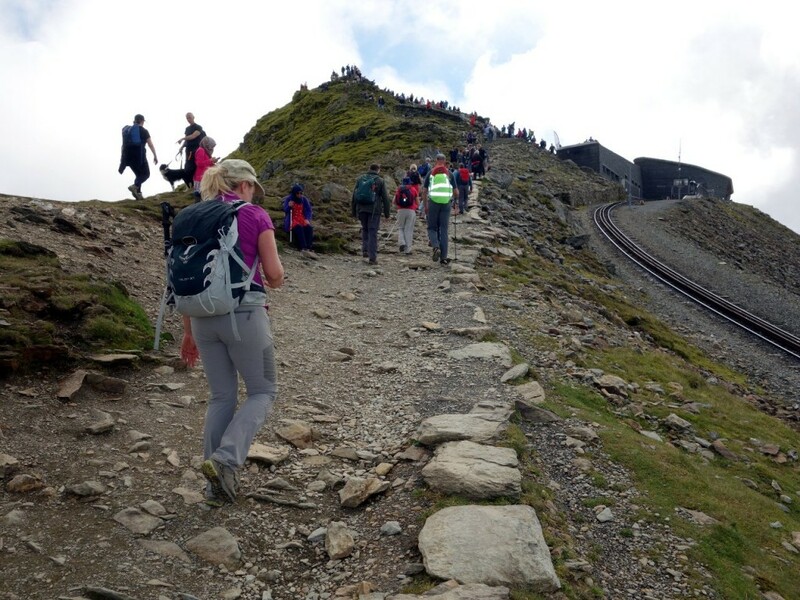 It was my seventh ascent of Snowdon, and the summit was as busy as I had ever seen it. Luckily we had packed sandwiches, and I knew you didn’t have to walk far on Snowdon to find a quiet corner away from the crowds. We descended a short distance to the south, along the Bwlch Main ridge, a much gentler affair than Crib Goch and Crib y Ddysgl. After about 100m we turned left onto the Watkin Path, down a steep scree slope that caused us to get out our trekking poles. I was getting a little peckish, but this wasn’t a great place to stop. Far below us to our right was the huge grassy basin of Cwm Tregalan, to the side of which the Watkin Path wove its way up. In front of us rose the final peak of the Snowdon Horseshoe, Y Lliwedd, at 898m not quite high enough to be one of the Welsh 3000ers, but impressive enough from this angle. Its left-hand side plummeted into Cwm Dyli in a series of sheer cliffs, while its steep southern side wasn’t a whole lot friendlier. It was the only part of the walk I hadn’t done, and although I knew it doesn’t have the reputation of Crib Goch, I was expecting another scramble. I had to watch my feet as we descended the scree slope, but after 200m of descent the path levelled out to traverse for about half a mile along the edge of the horseshoe. There was a grassy knoll to the left of the trail, and we slipped behind it to find a tranquil spot with a superb view across Cwm Dyli to the dramatic ridge we had just traversed in the morning. We were hidden from the trail, and as I expected we were now in a quiet corner of Snowdon where no one would bother us. We could eat our lunch and imagine ourselves to be the only people on the mountain. It wasn’t to turn out like that, for what we didn’t know at the time was that we had inadvertently chosen a grandstand seat. As we sat there eating our lunch, a helicopter buzzed overhead. It circled around Cwm Dyli a couple of times before hovering above the Pyg Track at a point close to the western end of Llyn Llydaw, directly across the combe from where we sat. Walkers on the trail had stopped to watch, and others stood transfixed a few hundred metres above on the crest of Crib y Ddysgl. 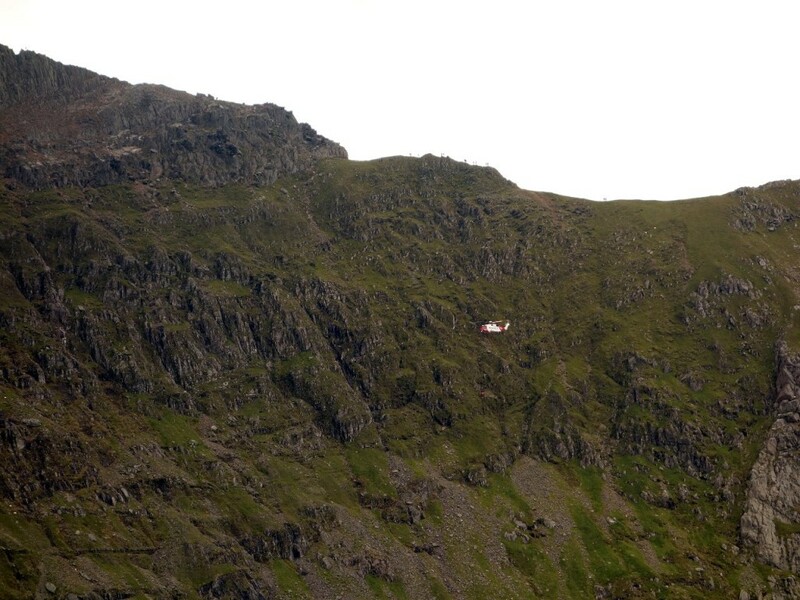 When the helicopter swung around to fly away, we could see that a figure in red had been lowered onto a ledge about halfway between the ridge and the Pyg Track. Later on we noticed two more red objects a little further down the hillside. It took us a while to discover what had happened. Our first thought was that someone had fallen off the ridge and landed on a ledge halfway down the face. In this case they must have fallen more than 100m, and their chances of survival would not be good. But something wasn’t quite right, for it wasn’t the most obvious location for a fall. They were just beyond the broad haven of Bwlch Coch, at a place where the rocky ridge of Crib y Ddysgl is just beginning. At that point the ridge is still quite safe and wide. It was only later that I found out about the escape routes off the ridge at Bwlch Coch. A couple staying at the Pen-y-Gwryd told us they were descending the Pyg Track directly below when the rescue took place, and were instructed by the Llanberis Mountain Rescue Team to stay where they were. They told us that it wasn’t a fall, but a party trying to escape off the ridge. It wasn’t until the following day that we discovered the full story. A young family were trying to escape off the ridge, but became trapped on steep ledges. A 7-year-old boy had fallen thirty metres and injured himself. They had made a bad decision, but by a miracle all was well, thanks to the good work of the mountain rescue services. By the time we finished our lunch our quiet corner of Snowdon had become a viewing platform as hikers on the Watkin Path wandered over for a closer look, and mingled a few metres away from where we sat. When the excitement was over, at least for a short while, we packed away our things and moved on. The broad Watkin Path traversed beneath the ridge, but we chose a less distinct but more picturesque trail on the crest of the ridge which enabled us to look down over sheer cliffs into Cwm Dyli. After half a mile the Watkin Path swung right into Cwm Tregalan, and we kept straight on up the sloping prow of Y Lliwedd. It was a new bit of mountain for me, but the trail was fairly clear, and the views to our left spectacular as we kept close to the edge. There was a modest amount of scrambling, but nothing to compare with Crib Goch or Crib y Ddysgl. Towards the top the path drifted to the right beneath the sloping southern flanks of Y Lliwedd, and we zigzagged up on a scree-lined trail. Y Lliwedd has two summits a short distance apart. Neither were marked by cairns and my map was in my pack. We didn’t know which was the higher one, so we crossed over both (in fact the first one, the West Peak, is 5m higher). We’d been blessed with the weather, and had enjoyed clear views all the way round, but as we arrived on the summit of the East Peak we could see the mist sweeping up from below. Although there is a well-worn path back down into Cwm Dyli, I had never been along it before, and I know how easy it is to take a wrong turn in thick mist. For about ten minutes visibility was down to only a few metres. Our route down into the combe was to the left of the ridge, so we chose to keep to the crest rather than the clear path to the right of it, which could take us anywhere. It wasn’t long before we descended out of the mist and enjoyed clear views again. Descending off the ridge we caught up with a party with a dog. The route crossed grassy ledges in a final short scramble before reaching a firmer trail down to the lakeside. The walkers had descended the ledges, but the dog was stuck at the top, barking at them as its owner tried to encourage it down. After frantically scurrying left and right it finally found a way. They told us the dog had been all the way around the horseshoe. The crest of Crib Goch had given it no trouble at all, but there was a section of Crib y Ddysgl where it chose a lower route on the left-hand side. The owner said he was pretty sure he’d been more scared than the dog. We descended to the lake shore as the sun touched the rocky spine of Crib Goch on the other side. It was beautiful sunshine again as we joined up with the Miners Track, and the hordes of people returning to Pen-y-Pass car park. The trail here is like a tarmacked road, but we were very satisfied with our day as we continued onwards on the path down to Pen-y-Gwryd. We reached the hotel at 4.30, a little under seven hours after setting out. 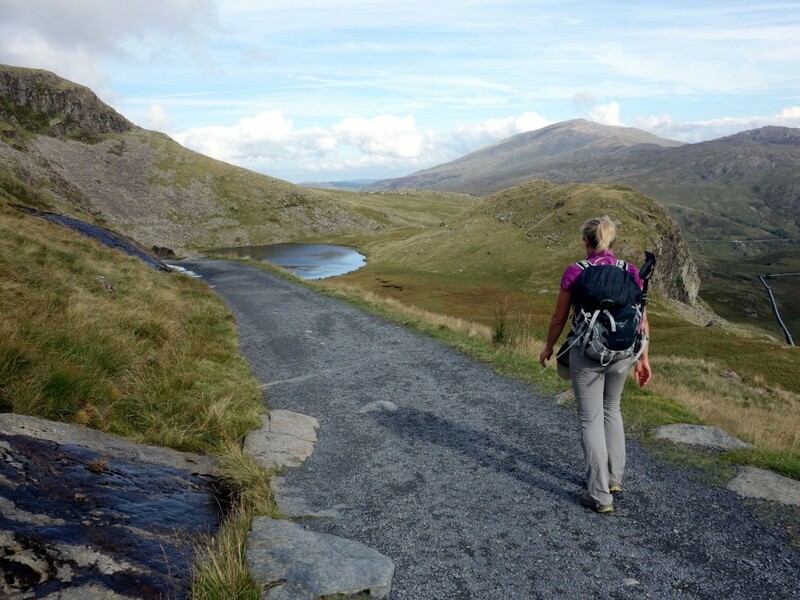 Edita’s first experience of Snowdon had been as good as it gets, as had mine of the horseshoe. 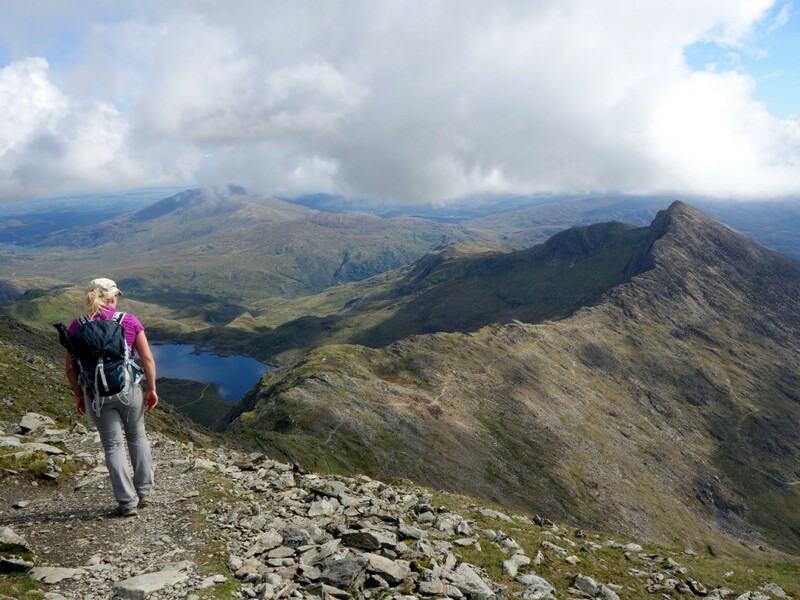 There are many great routes up Snowdon, and I’ve now done all the main ones, but for hill walkers the Snowdon Horseshoe is definitely the very best. Her reply isn’t printable, even for this blog. You can see the rest of my photos from our hike starting on p.3 of my 2015 Flickr album. 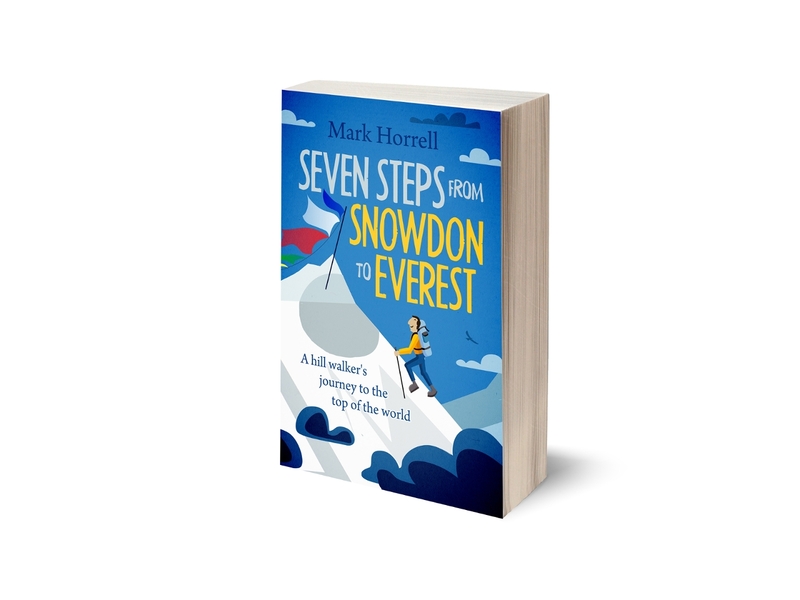 My book Seven Steps from Snowdon to Everest, about my ten-year journey from hill walker to Everest climber, is available now half price for pre-order from Amazon and iTunes. You have a gift for narrating (especially the dialogue back and forth! ), and the pictures of this trip are beautiful. I’m so envious of everyone who lives in a region that doesn’t require extensive travel just to reach a hill-walking destination (I’ve lived in sunny, oh-so-flat Florida all my life – the shortest trip to even gently-rolling hills is 5-6 hours by car). One question: you reference hikers trying to “escape” off the ridge – are they simply seeking shortcuts to the base? Is it not possible to backtrack if they decide the trip is too strenuous? Thank you for the kind words, Serafina. 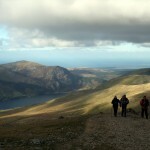 I’m sure Florida has other advantages, not least the weather – we caught Snowdon on a good day! Yes, they can backtrack, but the main reason people want to escape off the ridge is because they don’t like the exposure, and mistakenly believe it’s safer to take a shortcut straight down, where they can get into all sorts of trouble when they come across a vertical section. It’s pronounced exactly as it’s spelled 🙂 Welsh spelling is very straightforward and consistent, though unintuitive to English speakers. See https://en.wikipedia.org/wiki/Welsh_orthography#Letter_names_and_sound_values for the letter-to-sound mapping used; Crib y Ddysgl is pronounced roughly “crib i-thisgill”. 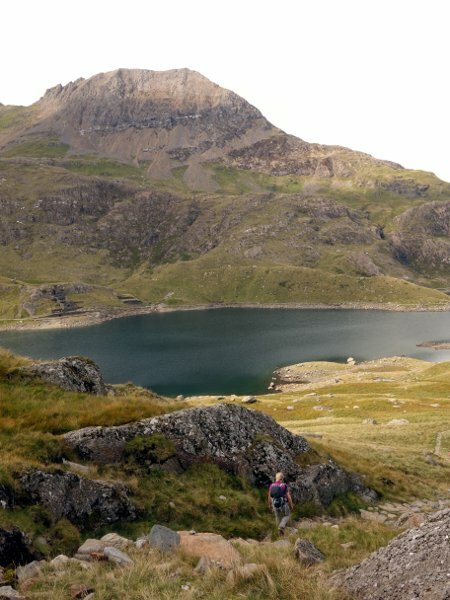 normally a lake district fell walker (due to location more than anything else) but thought I would make the trip to north wales to try out the snowdon horseshoe after reading this blog entry and glad I did! Have to say we wasn’t quite as fortunate with the weather (rain, mist and winds) but your crab like shuffling method did seem the safest option! thanks for posting this up….I think I may have to make a return trip next summer as we got to see nothing in terms of the views on your pictures! Thanks, Rick, glad you enjoyed it. Snowdon is always worth a return visit, and there are many other enjoyable routes if you don’t fancy repeating the crab-like shuffle! That was a great read Mark. It’s fascinating to hear that snowdonia still holds an appeal to you despite your considerable experience in more ‘exotic’ locations. I’ve always found Y Lliwedd the highlight of the Horseshoe as it tends to be alot quieter, offers better views and is alot less exposed than Crib Goch. Weather tends to be hit and miss though, good to hear it was on your side that day. I think I did this same walk on the same day as you. I’ve just realised after reading about the helicopter. My party and I passed a family – parents and a couple of young kids – coming over Crib y Ddysgl clockwise, and I remember thinking “I should warn them that coming this way isn’t really suitable for kids.” Then when we got up to Y Lliwedd we saw the helicopter. It may have been a coincidence, but the incidents seemed linked to me. Anyway I hope the kid was fine. It was a great walk, I’m glad you benefited from the weather that day too. Absolutely fantastic article. Great balance of humour but with a real respect for the mountain and pointing out the risks involved. Well done. I did this walk as a 17 year old Venture Scout with a hangover and we got caught in a snow blizzard in June for 2 hours, couldn’t see each other faces. 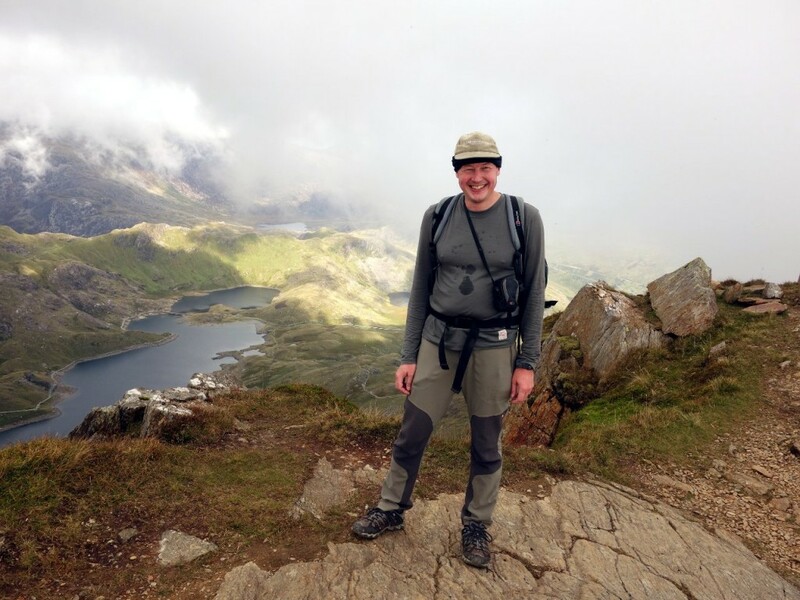 I’ve also done Snowdon via the Miners/Pyg Track and as part of the 3 peaks challenge, in picture postcard conditions, and driving rain and next year hope to do the full Snowdon Horseshoe walk with my cousin and 2 children, as an ageing 49 year old. What a mountain, what a majestic place. Please let me know if you have any other published works on hillwalking.